Information on variation in land rents can be an important tool to value amenities, accessibility, public goods, et cetera. A huge empirical literature using hedonic pricing techniques uses this insight for the purpose of valuation of individual aspects of the location, such as accessibility of jobs, facilities and open space, noise levels, et cetera. Despite the importance of land rents for policy purposes, surprisingly little systematic information on variation in land rents is available. In so far as local governments have information on actual transactions, this information is oftentimes not publicly available. Our aim is to fill this void by providing figures on land rents for the whole Netherlands on a detailed spatial level. We present a simple methodology to derive land rents from housing prices by exploiting information on variation of lot sizes. The methodology is used for the Netherlands using unique information on more than one million transactions over the period 1985-2007. The spatial variation in derived land rents is illustrated as well as the association with, among others, population density and distance to the city centre. Data on average land rents and average growth rates on municipality and four-digit zipcode level is now available for download. 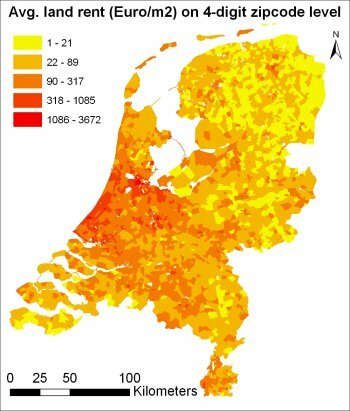 Henri de Groot has documented the methdology used to calculate the land rents on a detailed spatial level for the Netherlands. The paper is available for download on this website under Publications.